We visited Jay's parents for Mother's Day and had a wonderful time relaxing (I did) and working (Jay did). 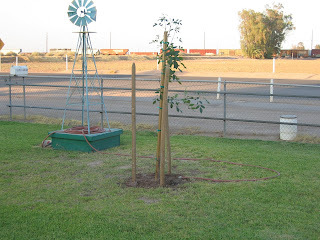 Jay and his dad planted an Ash tree in their front yard. 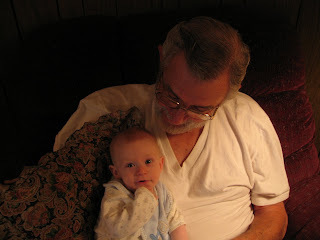 Mason loved sitting with Grandpa and getting lots of kisses while giving lots of smiles. 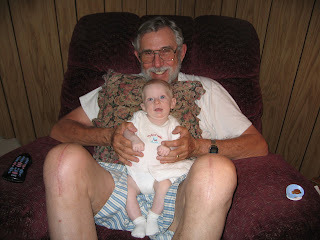 You can see Grandpa's new scar on his right knee from his recent knee replacement surgery. He's making a full comeback! Madeline continues to grow up; she's becoming quite the big sister. We often refer to Mason as "Buddy Boy", but when Madeline says it, it comes out "Bunny Boy". She always gives a reason to smile! It being Mother's Day, I thought it appropriate to add a picture of Grandma (I only had 2 because you were behind the camera the whole time)...thanks for all your love and hard work. Great pictures and great to know there was relaxing being done with family!